Last night in Melbourne. . .
Tonight we went to eat at Bizarro's with Brandon. Megan had a softball game so she wasn't able to join us. The restaurant was beachside, at Indialantic, and is New York style pizza. It was very good. When we had finished, we walked over to the boardwalk and watched the ocean for a bit. It was very calm which was surprising after the storms we have had the last couple of days. Afterward, Brandon took us on a ride out on Merritt Island to show us the really big houses that sit on the Indian and Banana Rivers. In some places where the road is narrow, the lots run from river to river. We went back to Brandon's house and I took a couple pictures of Brandon and Jax. As we left, we saw a rainbow across the road. Terry and Brandon are standing in front of Brandon's house. Tomorrow we leave and head north. Our goal is Indiana, but it will take about a week to get there. We are still here in hot and humid central Florida, even though from our location on the Indian River, we get almost constant coastal breezes. The temps are still high, we baste ourselves often and I'm pretty sure if you stuck a fork in us, we would be well done. We just missed a shuttle launch when we arrived here. As often as we are here, we have never seen a launch. We heard a shuttle coming in break the sound barrier once, but that was it. Brandon, of course, has seen several and has pictures of an awesome night launch. For many Floridians, even though this happens regularly for them, they still get excited watching a launch. To the traveler, however, it is almost impossible to schedule around a launch, since they are almost always postponed for various reasons. Saturday was a launch day for an Atlas rocket, sending some kind of weather equipment up into orbit. We were told we could see it from our camp, but our campground has a pier which extends out into the Indian River, so that is where we positioned ourselves. Launch time was 6:14 p.m. and we were ready, but it just didn't happen. There was weather to the southeast, closer to us, and we were unsure if it would go or if we would be able to see it. As the minutes clicked off we got to watching some dolphins playing in the river. I happened to look back just as the rocket ascended into the sky. I yelled and Terry looked and we saw it. Good thing we looked when we did, because it doesn't take long for it to be out of sight. We did have clouds, but we saw it rise before it was obscured by the clouds. I took pictures, but we are about 40 miles away. What was visible was the fire plume at the rear of the rocket. What a site. I hope you can see it. We spent earlier Saturday at Brandon's trimming bushes. I really don't know much about trimming Florida fauna and foilage, but I certainly don't like bushes up against the house, so I whacked away. I tried to confine the whacking to the back and when I was done, you almost couldn't see what I had done, but the house was clear of brush. I got all the dead stuff pulled out as well. With the heat, it appears a lot of limbs are dying off, so by trimming things up, they should be healthier. Terry and Brandon worked on a tree by the driveway that interfered with getting in/out of the car and they also did the plants/trees in the back yard. It didn't take long, and it sure looks a lot better. Afterward, we all jumped in the pool and enjoyed the cool water. When it started to rain, we got out. . . just in time, too, as we had a heck of a rainstorm. But an hour later, you really could not tell there had been a storm. Yesterday we took Brandon and girlfriend Megan out to eat then to see Transformers2. What a great movie. Terry and I had watched the first one the night before so we were all "primed" to watch the sequel. Sunny and HOT Melbourne, Florida! A sunrise on Indian River captured from our campsite by Terry as I don't get up that early! We arrived here last Thursday and have been spending most every day at Brandon's. It has surely been hot here. Very high humidity and they have been setting records of 99*, with 120* heat index. So.............naturally we are staying indoors. He keeps his house cool, so that is good. I spend time in the pool which is really nice. It is not heated, but feels just like bath water. I bought a hat so I can keep my face shaded. Brandon's project for his dad was to get some shelves put up in his garage so he could organize it more. They made the rounds of all the lumber yards on Friday on Brandon's day off, then went back Saturday and bought what they needed and got them set up. They are really nice shelves. His garage looks much better now and he has room for his car and his and Megan's motorcycles. They also moved stuff around so now his attic pull down stairway is accessible. While they were doing that, I was watching the dogs. Jax, it turns out, seems to like Neal, and Neal, of course, likes everybody. Our spider which was living in the outside mirror has left us. Not sure. . . maybe he couldn't stand the heat, but I haven't seen him lately. I planned on relocating him, but now there is no n eed to. But we have seen a lot of wildlife. Terry particularly likes the little skinks (small lizards) that run everywhere. They are quite comical to watch. We also see a lot of pelicans and osprey. The ospreys are large birds which eat only fish. They are very large birds and build their nests up high like eagles. We have seen more this time than any other time we have been here. They are white underneath, with a white head and a black streak through the eye. Yesterday we went south. Since Brandon was at work, we decided to take a drive. We went down to Vero Beach, then cut across the bridge to A1A and the beaches. The water was so beautiful. Such a lovely color and extremely calm. It would have been a great day to be on the beach. It was hot and the water looked really refreshing. We then went north to Sebastian Inlet. They have a fishing pier and we always like to walk out on it. We frequently see porpoise, but this time we saw manatees! There was a small pod which was swimming in toward the bridge close to the bank and we got some really good views of them. The water at Sebastian was beautiful as well. On the south side of the bridge, it was extremely calm which was very unusual, but the north side of the pier was a little choppier. It was still a good day at the beach and there were a lot of people out enjoying it. Last evening we had a storm come through. It was supposed to be a little worse than we had although we lost our electric about 4:30 this morning. If was off for about an hour. Today we drove up to Cocoa Beach and visited Ron Jon's surf shop. It is a little overcast and is supposed to storm later again. We are headed over to Brandon's tonight for supper. We are going to cook up some of the fish he brought back from cousin Gary's last winter. Should be a great fish fry! Wild Kingdom in Bushnell, Florida! Many of you know our wheaten Scottie, Neal, has a bashful bladder. So when we put him out to do his "business," we must HIDE somewhere so he doesn't see us in order for him to have some privacy. Here at Bushnell at the Escapees park, we are parked right behind the office. We walked over there to wait on Neal and we found little tree frogs up on the the wall near the lights catching their nightly quota of bugs. They were so cute. We didn't disturb them, but did get a few pictures. Prior to our family reunion last Saturday, we lost power a couple times Friday night due to inclement weather. We knew there was some really bad weather, but we escaped the worse of it while camped at Bay Springs Lake. When we drove to the reunion at the Marietta Community Center, we passed by the Marietta Springs Park where we have traditionally held the reunion. There were four trees uprooted in this picture. We didn't go up to the entrance to the park up the hill, so there may have been other damage as well. We saw many more trees uprooted in yards around town. A bad day for someone! We were driving from Red Bay, Alabama, to Tifton, Georgia, today when we saw this. It was a trailer which appeared to be homemade being towed by a truck with a camper shell. The truckers said a truck passed him and the driver "lost it" sending the entire rig into the ditch. There were lots of people standing about, no ambulance and no panic, so I am guessing no one was injured too badly. When we were at Dale Hollow, we unwittingly picked up a hitchhiker. He hides every day up in the arm of the mirror assembly and comes out at night to build his intricate web. If you know me, you know I hate spiders, but he traveled from Dale Hollow to Nashville down the Natchez Trace to Piney Grove at Bay Springs Lake in Mississippi. From there he traveled a short distance to Red Bay, Alabama, and today covered almost 400 miles to Tifton, Georgia. He has made his web for the night and is ready to feast on unsuspecting insects. I just cannot kill him. I decided I will eventually relocate him when I have the chance. Well, we arrived in Red Bay on Sunday morning with a storm on us almost immediately after pulling out of the campground at Bay Springs Lake. It was wind and rain, but we only had 25 miles to go, so we made it fine and Phaeton Place got a good bath along the way. Since we had an appointment, we were in a service bay at 7 a.m. this morning and we were done by noon, courtesy of a short list this time. We did have several parts we bought so Terry could fix things himself, i.e., switches, lights, etc. The service techs are helpful and will let you watch how to do something and then the next time you can do it yourself. We also ordered two new dinette chairs to replace the big overstuffed ones that were the standard issue. The springs were a constant problem in them and we took to using our "extra" folding chairs. And now we have added two new extra chairs just like the others and will recover them in the fabric we bought that matches our recliners. So now we are ready to go tomorow. In fact we are all hitched up and will leave early tomorrow. We are headed to Florida to see Brandon, his girlfriend Megan, and his dog Jax. We are anxious to get there and spend some time visiting. Tonight another storm went through Red Bay. This one was more intense than Sunday's storm and was actually just the fringe of the one that passed through Florence and Russellville, Alabama. They opened the customer lounge for us to go there, but we decided to pull in our slides. By the time we got done, it was storming pretty good, so we decided to sit tight. It looked terrible out, but we didn't have anything too bad weather wise. At least here at Camp Allegro, there are no trees and with the coaches lined up close together, there is some protection. That is, unless the first coach in the row starts to flip, we will just all fall down like dominos! Fortunately that didn't happen and things have cleared now and the temperature is down to a more comfortable 70 degrees. A bad day at the lake . . .
is better than a good day at work. Right? Isn't that what they say? Well what about a good day at the lake . . . or two good days at the lake . . . or three GREAT days IN A ROW at the lake? Huh? What do you say about that? . . . I think I'm in heaven. . . and whew! Am I ever tired! The rain cleared out last week and we got the boat back in the lake with a brand new starter. I did enjoy a couple of great days on the jet ski while we waited on the boat. Terry is not a big jet ski fan, so he sat on the deck at the dock and communed with other boaters and enjoyed the nice breeze coming off the lake. One day Terry drove the boat and I road the jetski to Eastport dock which is about 12 miles from our camp. On the way back I took some pictures of the boat in the water. We have so few pictures of it because we are always in it. Hah! So here are a couple shots. Then Terry decided to get some pictures of me on the jetski. I guess I was too fast for him. . .
On other outings we went to the state dock which is so much different than it used to be. 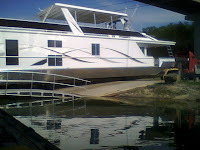 It now has a new store and new boat slips and some prime covered houseboat slips. There have been several docks on the lake that have improved their facilities over the years we have been coming here. We also went to Wisdom dock, Sulphur Creek and today we drove almost to the dam (30+ miles by water) and had lunch at Mitchell Creek. This dock was previously called Livingston Dock and has been completely updated with a new restaurant and store. We were trying to remember just how many years we have been coming here and we came up with 25 years. I think Brandon was about 3 or 4 when we started coming. We always camped at the state park which I understand has been improved as well, but now we stay at Obey River (pronounced ob-ie). The lake is beautiful and I have included several shots of it. While we were putting the boat in the slip last evening, we heard a helicopter overhead. It landed on the other side of the dock. 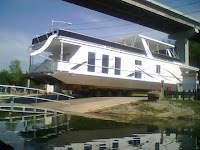 We found out later that it belongs to a houseboat. 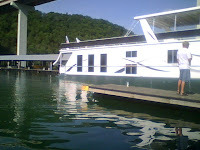 It is a small, private helicopter and the landing pad is the roof of the houseboat. We decided we have found our new rig and toad! Hah! Last evening we put up the jetski up and today after spending all morning and part of the afternoon we brought the boat back to the site and got it ready for the storage bay. Now both are snugly back in their home. We are enjoying our last evening at the lake. We don't have to leave here too early because we are headed over to Nashville and another COE park, so check in is later in the afternoon and we don't want to get there too early. We plan on making this a yearly trek. We arrive here on Monday, Memorial Day, and stay here enjoying the lake until it's time for the Pace-Stevens reunion in Mississippi. Today we were down at the dock getting a slip sticker for the jet ski so we can park it in the covered slip. 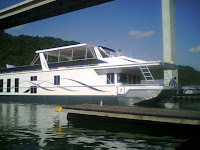 Sitting on the one end of the parking lot was a new 15x85 foot new Fantasy Yacht houseboat. The crew was on it getting it ready to launch it for the first time. What a beautiful boat. 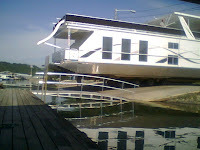 The owners were sitting on the dock taking pictures and I had left my camera in the motorhome. But I had my phone, so I got some shots of the launch. These are shown in the order they are taken. The ramp is big but dwarfed by this huge boat. The semi-driver hooked up to the trailer and pulled it out of its parking spot and manuevered it lining it up for the trip to the water. As he backed up, the rear three axles of the trailer were actually suspended in the air as the ramp has a break where it angles down to the lake. We thought the front axle tires were going to blow as they were supporting the entire weight and were going flat. You could hear air hissing. There was a skid plate on the bottom of the trailer to protect the boat and it was scraping the concrete. There were some overhead power lines which were in the way and the boat crew had plastic pipe poles they used to lift the wires over the bridge of the boat. These guys all knew what they were doing. One guy on the ramp with a radio, the driver, one guy unhooking straps, and two guys manning the power lines. There were more people involved, but those were the main ones during the launch. The driver then released the jacks on the trailer and they swung up and at the same time, he backed quickly and the trailer tipped back on the four axles and it entered the water. At this point, water started to rush in the back of the boat and the bilges were started to keep the water out. One more lunge and the boat was in the water floating free. It was like a perfectly choreographed dance. It took maybe fifteen minutes to launch. The owners were very nice. We learned they got a really good deal on this boat because of the economy. This boat retailed at a million dollars and they bought it in the $300,000 range. I want one.